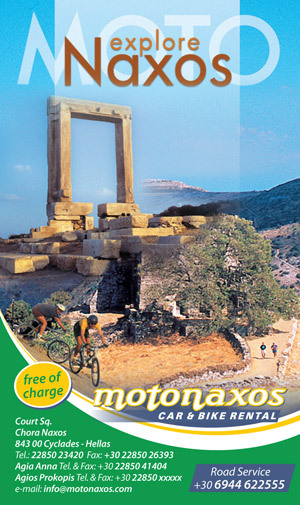 Questions on making a rental car or bike reservation on motonaxos.com.Our answers below tell you what you need to know. At the end of the reservation process you will receive a confirmation e-mail containing the details of your reservation. You should print these and keep them for your records. Yes, you can modify or cancel your reservation by e-mail or through the automatic system after it is confirmed, provided it is done up to 48 hours prior to rental time. Yes, you can cancel your prepaid reservation by e-mail after it is confirmed, provided it is done up to 5 days prior to rental time. All the vehicles are supplied with third party insurance which means that in case of an accident our insurance company covers the cost of the damage you have caused to another vehicle. The Collision Damage Waiver covers any damage caused on the rental vehicle regardless of who is at fault with an excess depending on the type of the vehicle. The Full Damage Waiver insurance reduces the excess amount the renting person may be obliged to pay for collision damages. In order to purchase the CDW or the FDW you have to be over 25 years old and up to 75 years old for the most of the rental vehicles. Please pay attention that you have to have your driver license over 2 years in order to buy the CDW or FDW. Can I buy any extra insurance for renting a scooter, an Atv or a buggy? In the prices is already included the thirty party insurance. For renting a scooter, an Atv or a buggy you may purchase an extra insurance locally. Is it possible to buy FDW insurance for a scooter, an Atv or a buggy? Extra insurance for scooters, Atvs and buggies are available only locally and the maximum protection you can have is by purchasing the CDW, as FDW does not exist for such kind of vehicle. Is my driver’s license valid in Greece in order to drive a scooter or an Atv? For European citizens check the link below http://eur-lex.europa.eu/legal-content/ES/TXT/?uri=CELEX:32014D0209. For non-European citizen please contact us by email. Can I proceed to a reservation without having a credit card? Of course you may proceed to a reservation without having a credit card by sending a bank deposit. Please note that you will need a security deposit in order to rent the vehicle locally.